European and continental food is very easy to find at many restaurants in Mumbai and everyone has their own versions of the classic recipes. Brickhouse is one of them and it is pretty descent to begin with. Here’s sharing the #MoodyFoodie experience of Sunday Brunch at Brickhouse. I was here the other day on a Sunday noon for their popular Sunday Brunch. They serve a set menu of 5 course meal with unlimited Beer/Sangria for INR 999/- Sounds cool right? We landed at the restaurant which is located at the heart of Andheri and is very easily accessible from different parts of the city. The decor is what caught my attention the very moment I entered through the small swanky door. 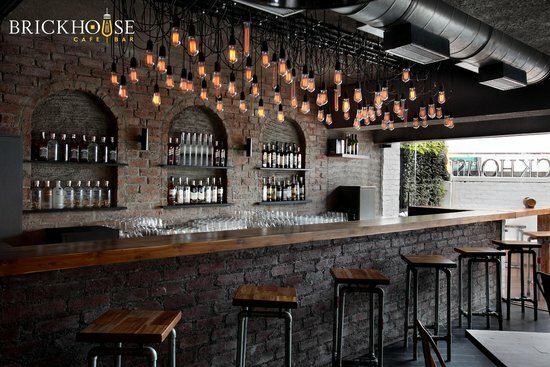 The ambience stands up to its name – Brickhouse. The walls are very roughly done up with some fancy filament bulbs which sets a perfect vintage mood. I big thumbs up for the ambience. The menu has some selected classic dishes and we opted for the bacon wrapped asparagus to begin with along side a salmon dish. I am a HUGE fan of recipes which include bacon, but this one really disappointed me and neither was the salmon very great. It totally lacked seasoning. Next up was the most anticipated dish on the menu. EGGS to order. We tried the Brickhouse special omelette and the Egg Florentine. Hands down the best omelette I have ever tasted. The next course comprised of some salads which I am not a big fan of. I am sort of allergic to healthy food 😀 But I love ceaser salad for an exception and the one they served was a bit different than the regular ceasar salads. It was not one of the great ones but neither was it bad. The other spinach salad with goat cheese was good. Totally love the mix of spinach and spicy mango dressing. I am sure gonna remember this flavour. I was very fascinated to see the cold meat & cheese platter on the menu and definitely wanted to give to a try. When it turned up on the table, it sure looked exquisite but damn! there were no different cheeses. It tasted good but it’s not a dish many will prefer to eat as it has a very different palette of flavour. We kicked off the mains with a pasta.. dish with shrimps and chilli oil. It was smoking hot with the chilli heat. HIGH ALERT for those who have low tolerance to chilli. Next up was the Basa fillet with mango dressing and it was pretty good but sadly the dressing was so overpowering that I could hardly taste any fish. As they say often the best is saved for the last. I think that saying literally came true when that little chicken thigh roasted with rosemary and mushroom sauce landed on the table. It looked amazing and it tasted out of the world. It was a party in my mouth. So tender and beautifully cooked chicken that I felt like going and kissing the chef in the kitchen who cooked it 😀 ( ok, I know that was a little too dramatic) It was one of the finest roasted chicken I have had in many years. It is definitely a must try. I don’t really want to comment on the deserts as it breaks my heart to even talk about how sad the waffles and pancakes were. Soggy, dry, bland and everything that a waffle or pancake should not be. I would love to hear your experience with Brickhouse or the dishes they served us. Comment below. P.S – The sangria is really fine flavoured.